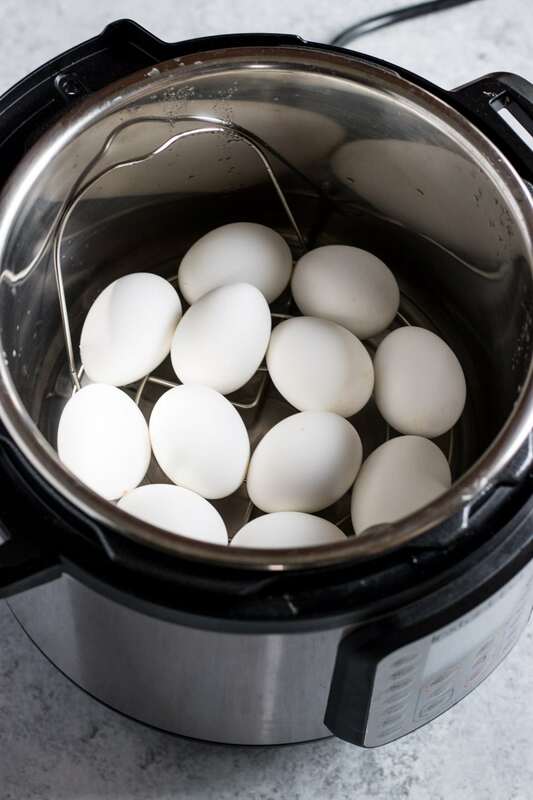 Save a little time and get perfectly cooked, easily peeled, hard-boiled eggs with this recipe for Instant Pot Hard-Boiled Eggs. The handy-dandy Instant Pot strikes again! Recently, I’ve been trying to make more of our go-to’s (like Chicken Cacciatore and Roast Chicken) in this multi-functional kitchen gadget. And, the latest staple food to get a go in the pressure cooker is hard-boiled eggs. No, hard-boiled eggs aren’t that hard to make on the stove, but I love the ease of just pressing some buttons on the Instant Pot and then not having to think about them until the timer goes off. Hooray for multi-tasking! It took me a couple of years before I broke down and invested in the Instant Pot. I just didn’t think I’d use it enough and didn’t want another gadget that would just sit and collect dust. Boy, was I wrong! I think I use this pressure cooker thing-a-ma-jig more than my slow cooker, which for me is a lot. Although the whole releasing-the-pressure-kind-of-thing was a little intimidating at first, after I got used to it (I use a spatula handle to “release the pressure” for me), I’ve really enjoyed experimenting with it. In addition to the whole cooking-faster-in-one-pot benefit, I really really like the fact that you can program it to do so many things, let it cook and not really think about it until the timer goes off. This is huge for me because I often try to multi-task while I cook (probably not the smartest thing to do) and will find myself with boiled over pots or burnt bottom pans. Whoops! Although Low FODMAP is not in the official recipe name, these Instant-Pot Hard-Boiled Eggs are indeed low FODMAP. Place the steamer rack into the Instant Pot insert. Add water and place eggs on top of the steamer rack. Place lid on top of Instant Pot and secure. Set vent to “Sealing”. Select the “Manual” setting on the Instant Pot. Adjust time to 6 minutes on “High Pressure” and cook. After cooking, manually release the pressure, by carefully switching the vent to “Venting”. Remove lid. 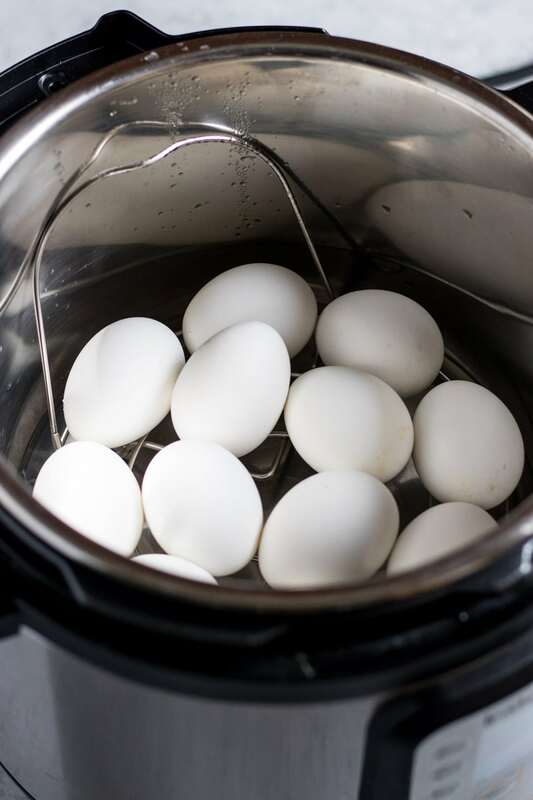 Using tongs, carefully remove eggs from Instant Pot. 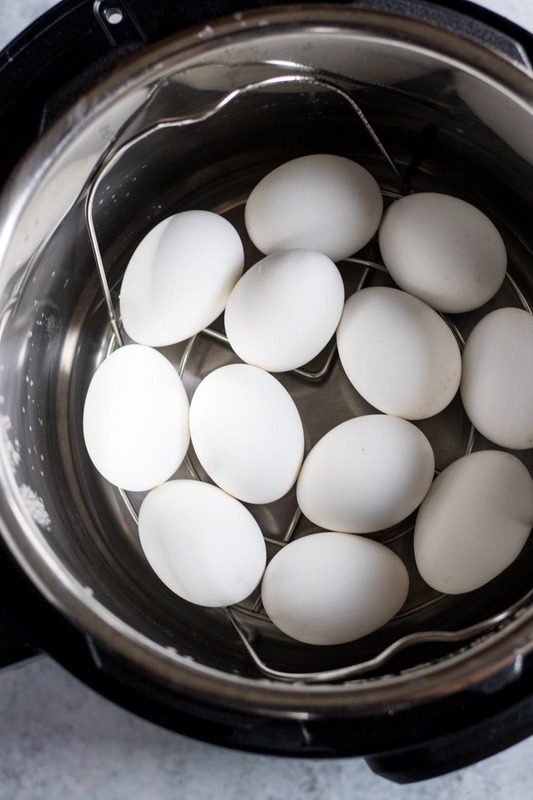 Place eggs in a bowl filled with ice water or into a strainer and run under cool water for 5 minutes. Once cooled, peel and use or store in the refrigerator for later use.